Isle of Palms is a popular vacation destination for travelers seeking a relaxing getaway, stunning beaches, sunny weather, and plenty of ways to enjoy it all! There’s no better way to spend an afternoon outdoors than with a leisurely game of golf. If you’d like to include some time on the green on your next vacation itinerary, read our guide below on the top Isle of Palms golf courses. Along with Isle of Palms golf courses, there are so many wonderful things to do in the area. For more incredible ways to spend your time while on vacation, access our free Vacation Guide. This carefully curated guide includes information on the area’s best restaurants, activities, and attractions. Begin planning the perfect beach getaway today! Considered among the “Best in the State” by Golf Digest, Wild Dunes Resort is a premier golfing destination. With two outstanding public golf courses designed by Tom Fazio, guests can enjoy 36 holes of world-class golf. The Wild Dunes Harbor Course on the Isle of Palms, SC, is known for its challenging design woven around lagoons, salt marshes, and the Intracoastal Waterway. Harbor Course’s newly renovated neighbor, the Links Course, offers stunning views of the Atlantic Ocean and an excellent design. You can’t go wrong with either of these picturesque Wild Dunes courses! Nationally acclaimed by Golf Magazine and Golf Digest as a Top 10 Resort Course, Dunes West Golf & River Club features a championship golf course surrounded by spectacular Lowcountry scenery. Located in Mount Pleasant, Dunes West combines a masterfully designed course, a charming clubhouse, and beautiful water and marsh views for an unforgettable golf experience. Every level of golfer can enjoy 18 holes of world-class golf on the grassy greens at Dunes West! Featuring breathtaking panoramic views of the city skyline, Fort Sumter, and incoming ships, Patriots Point is a longtime favorite golfing destination. Patriots Point golf course is located on the edge of the Charleston Harbor in Mount Pleasant, SC. The links-style par 72 championship course offers a design that challenges the most seasoned golfers while still providing a leisurely game for rookies. The ever-changing wind sweeping across the harbor provides a unique experience with every visit! Any golf lover’s trip to South Carolina is not complete without a round at one of the top Isle of Palms golf courses. Complete your stay by booking the ultimate accommodation with East Islands Rentals. 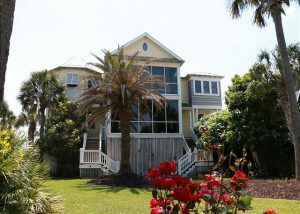 We offer the best vacation rentals on the Isle of Palms! At East Islands Rentals, you can enjoy a luxurious, oceanfront vacation rental that provides everything you need for an indulgent beach vacation. From seaside pools and private beach access to chef’s kitchens and spacious sun decks, our properties offer unparalleled amenities. In addition, our rentals are located with convenient access to all the best attractions in the area! Browse our selection of spectacular homes and book the perfect beach escape today!